Last year's Verizon Festival of Speed at Mazda Raceway Laguna Seca produced a first-time winner in the Grand-Am Rolex Sports Car Series presented by Crown Royal Cask No. 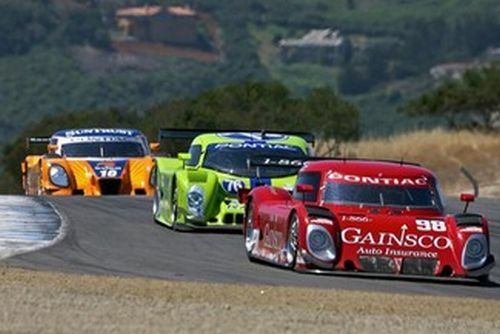 16 Daytona Prototype ranks, when Ryan Dalziel and Henri Zogaib teamed to give SAMAX its first victory. With three of the last four Rolex Series races producing first-time winners in the Daytona Prototype ranks, will Sunday's Round 4 at the historic Monterey, Calif., road circuit see another new face visit victory lane? See it live on SPEED, starting at 4 p.m. ET. In the most recent Rolex Series event, Krohn Racing's Ricardo Zonta and Nic Jonsson teamed to give the Proto-Auto Lola chassis its first victory, and Zonta's first triumph in the series. John Pew and Ian James won for the first time for Michael Shank Racing in the 2008 season finale at Miller Motorsports Park. Darren Law scored his first Daytona Prototype victory in the 2009 season-opening Rolex 24 At Daytona. This trend could continue this weekend. Penske Racing's Timo Bernhard and Romain Dumas have qualified on the front row for all three races this season in addition to leading each of the events. At New Jersey, Dumas won the pole in his first Rolex Series qualifying attempt, and both drivers led in Penske Racing's No. 12 Verizon Wireless Porsche Riley. A cut left-rear tire led to an unscheduled pit stop late in the race, with Bernhard battling back to finish third. While SAMAX is not entered in this weekend's race, team manager Peter Baron is directing the Orbit Racing Daytona Prototype efforts. Bill Lester - who is yet to win in the class - is paired with Dalziel in the same car that won last year's event, now running as the No. 45 Orbit Racing BMW Riley. Another winless team, Supercar Life Racing, finished fourth in its most recent outing at Virginia International Raceway with Scott Tucker and Christophe Bouchut. Other teams looking for their first victory include Childress-Howard Motorsports and Beyer Racing. A Comptech/Honda-powered Daytona Prototype is set to make its Rolex Series debut, with Jordan Taylor and Jared Beyer entered in Beyer Racing's No. 5 Lennox Comptech/Honda Riley. Beyer Racing will also race the No. 13 Lennox Pontiac Riley for Ricky Taylor and Mike Forest, who will be making his Daytona Prototype debut. Rolex 24 winners Law and David Donohue, co-drivers of the No. 58 Brumos Porsche Riley, enter the race with a four-point lead (88-84) over Virginia International Raceway winners Alex Gurney and Jon Fogarty, drivers of the No. 99 GAINSCO/Bob Stallings Racing Pontiac Riley. Three teams are within three points of the lead in the hotly-contested Acxiom GT championship chase. Leh Keen and Dirk Werner won at New Jersey Motorsports Park to pull into a tie for second. Both drivers return this weekend in the No. 87 Farnbacher Loles Racing Porsche GT3. While he has yet to win this season, Spencer Pumpelly finished second twice in TRG's No. 66 AXA/Mitchell Rubber Porsche GT3 to hold the lead with 89 points. Tied for second with Keen and Werner are Virginia International Raceway winners Andrew Davis and Robin Liddell, drivers of Stevenson Motorsports' No. 57 Bryan Mark Financial Pontiac GXP.R. Also entered in GT is racer/actor Patrick Dempsey, who scored a career-best seventh-place finish at New Jersey Motorsports Park. He will co-drive Dempsey Racing's No. 40 El Grado Tequila Mazda RX-8 with Joe Foster. Practice for the Verizon Festival of Speed begins Friday at 12:45 p.m. ET, with qualifying Saturday at 4:45 p.m. The weekend also includes a KONI Sports Car Challenge race on Saturday. Live timing and scoring, notes and results will be available on www.grand-am.com, with regular weekend updates also posted on www.twitter.com/RolexSeries.